“But in your hearts honour Christ the Lord as holy, always being prepared to make a defense to anyone who asks you for a reason for the hope that is in you” (1 Peter 3:15). You’ve probably heard the verse before. There is perhaps no clearer, more succinct description of apologetics in the Bible. Whenever we are asked to explain our hope in Christ, we are called to give an “apology”, a Greek term for “defense” or “answer”. But while many of us know that quotation by heart, few of us seem to realize that the sentence doesn’t end there. “Yet do it with gentleness and respect,” Peter continues. Gentleness and respect: two words seldom associated with Christian apologetics in our day and age. For too many of us, the major concern seems to be on winning the argument rather than winning (by God’s grace) the person for Christ. Back at the beginning of 2010, I led a weekly study group on apologetics for the local Inter-Varsity Christian Fellowship chapter at the University of Regina. In my preparations for the series, I came across John G. Stackhouse’s 2006 work Humble Apologetics. In the introduction to the work, Stackhouse tells the true story of a Christian attending a public apologetics event at his university. The story was so compelling, I made sure to read it at the introductory meeting of the apologetics study group at the UofR. It’s worth sharing with you here as well. Stackhouse recounts how the Christian, a student named Bob, entered the auditorium that night with great fears as to how well the apologist (his name is changed to “Dr. Ward” in the text) would do. But his fears were alleviated as, through the course of the talk, it became clear that Dr. Ward was was an excellent rhetorician, well-capable of making a case for the existence of God. At the end of the talk, students had the opportunity to pose questions to the speakers. When the very last speaker rose to talk… well, it’s best to just let Dr. Stackhouse tell the story. His question went on and on, and the student’s voice rose higher and higher as he began to rail against the Bible, Christianity, and finally Dr. Ward himself. Bob stared at Dr. Ward to see if he could possibly endure such an onslaught, and indeed Dr. Ward’s smile had become somewhat tight. At last, however, the student concluded his tirade, and Dr. Ward began to answer. “Quite,” said Dr. Ward, and turned magnificently to the student emcee, who was patently in awe of what he had witnessed. Apologetics is not just about making compelling arguments because, frankly, people are never reasoned into the kingdom of God. Dr. Ward might have successfuly countered the “argument” of the student questioner – but what he had not done was treat the man with gentleness and respect; had instead completely humiliated him. Moreover, he had reacted solely to a symptom while completely ignoring the underlying problem. The student’s vitriolic attack was clearly not a well-reasoned argument; what it showed instead was a broken man, angry at God. And what he needed was not shaming; he needed to hear the Gospel. When Peter writes that we are called to give a “reason for the hope” that is in us, we are not being called to simply refute arguments; instead, we are being called to share with the questioner the reason for our faith that she or he might come to have the same hope we have. When we are challenged, we must remember that we are not called to do battle with our “opponents”; we are called to share with them the Gospel. In the weeks following the introductory session of the apologetics group at the UofR, we critically engaged with many of the major areas of apologetics: classical (and contemporary) arguments for the existence of God, the subject of creation/evolution, the problem of evil, the historicity of Scripture (especially regarding the person of Christ and his life, death and resurrection), and so forth. But through it all, there was an overarching recognition that, when it comes down to it, apologetics is about much more than being able to debate the logical merits of this or that argument. It’s about sharing hope. It’s about encouraging faith. It’s about the Gospel. The list is a day late this week, but better late than never. An eclectic collection of news and views from the past week on faith, language, and literature, as well as other topics of interest. There’s some new language revitalization work going on in Canada. Thanks to a new program by the Office of Gaelic Affairs (Government of Nova Scotia), Nova Scotians are being offered the opportunity to take part in Gaelic Immersion activities. The program, entitled Bun is Bàrr (tr. Root and Branch), matches Gaelic elders with interested students for 360 hours of immersion over a twelve month period. The Chronicle of Higher Education has a good article on the value of writing groups. The focus is primarily on academic writing, but the ideas are no doubt applicable to other styles of writing as well. Mollie Ziegler Hemmingway has an interesting reflection “In Praise of Confidence” over at Christianity Today. She suggests that doubt is part of the cross we bear as Christians – something to be endured, not celebrated, as some have taken to advocating. Episcopalian priest Rev. Steve Lawler caused quite a stir this week as news circulated that he was taking up Muslim religious practices for Lent. Reading the Qu’ran, praying to Allah while facing Mecca, and observing Islamic dietary restrictions were all part of Rev. Lawler’s plans – until, that is, his bishop threatened to defrock him. Read about it at Christianity Today. And finally this week, The Daily Mail features the story of Jacob Barnett, a twelve-year old set to begin PhD research at Indiana University-Purdue University Indianapolis. He had already left highschool for the university at the age of eight. Now, just a few years later, Barnett is working on his own expanded theory of relativity. And the work’s credible. Speaking on Barnett’s ideas so far, renowned astrophysics professor Scott Tremaine noted that “The theory that he’s working on involves several of the toughest problems in astrophysics and theoretical physics. Anyone who solves these will be in line for a Nobel Prize.” By contrast, the fictional Sheldon Cooper of Big Bang Theory fame only began doctoral studies at the age of fourteen. Fact beats fiction yet again. In my previous two articles in this series on Christianity and Literature, I discussed the benefits of literature with a focus on wisdom: namely, the idea that literature offers readers the opportunity to experience ideas, words, and actions which are different than their own. Wisdom comes in weighing this Experience and judging whether it be true or false, good or bad – separating the fruit from the chaff, in Chaucer’s words. We might call this the didactic aspect of literature – it teaches us, whether intentionally or not, about creation, our place in that creation, and our relationship to its Creator. But of course, good literature is not just about imparting knowledge – if that’s all literature were, the dictionary would be the most thrilling book around. Instead, as C.S. Lewis reminds us, all works of true literature have two sides: logos (something said) and poiema (something made). Narratological musings, the dialogues and life experiences of fictional characters, and the consequences of these experiences might all be considered part of the logos. But the second aspect of literature, poiema, refers to artistic construction and the reader’s artistic reaction to the text. Put simply, the logos is what the author and his characters say; the poiema is how they say it. And just as the logocentric Experience is one of the good things literature gives us, so too is poematic Beauty. Of course, just as there is good logos and bad logos, there is also good poiema and bad poiema. If a text is full of clichés, for example, if it is constructed solely of ideas and experiences according to a pattern repeated a hundred times before, without any originalities or creative interjections by the author, we may rightly consider the work to have low aesthetic value. Not that newness for the sake of newness necessarily leads to aesthetic goodness either. A good piece of literature must blend originality with tradition. There are of course additional standards by which we might choose to judge good literary construction from bad (Aristotle’s Poetics has been used in just such a way). But let us bypass for now discussions of aesthetic criticism and come to what is the more important matter in this series of articles: namely, if poematic Beauty is a principle good of literature, as I argue, what exactly is good about it? The Experience, as we have seen in previous articles, offers wisdom. What similar good does Beauty offer that Christians should care about it and earnestly seek to encounter good examples of it in literature? So too beauty. Aesthetics cannot be broken down into a series of underlying mathematical formulae; it is not a science, Aristotle’s opinions on the subject notwithstanding. But while critical reflection cannot explain fully what beauty is, it can nevertheless help us to begin approaching such a definition. Consider: if two men should be sitting near a fire place, neither experiences the full heat of the flames; they are only near the fire, not in it. But if one should step nearer to the flames than the other, he experiences more directly the heat and light than does his friend. Critical consideration and appreciation of Beauty helps move us closer to the fire. And as we come nearer that fire, we begin to understand, if only intuitively, what good thing Beauty offers readers. Not that it can be explained in words, but that it can be suggested in image. The heat which rolls over us in waves, the flash as the flame fills our vision depicts, in a way, how Beauty acts on the reader. It is baptism by fire, a death and resurrection as the water of poeimic Beauty mixes with the Experiential word. It is the fire in which rides the still small voice. It is the burning coals which permit sinful lips to speak. It is, in the end, not something explained, but something encountered. Something felt. Something understood. Ecclesiastes tells us that “of the making of many books there is no end, and much study is a weariness of the flesh;” arguably, this assertion describes the plight of most of us English students who, out of the many texts in our ever expanding discipline, must be wise in considering what books we read and how to read them. Christian literary scholars find themselves in even more of a predicament, not only having to determine what to read, but also what it means to read books as Christians. Although I haven’t yet had time to purchase let-alone read this book, I nonetheless suggest that we couldn’t do much better than turn to Drs. 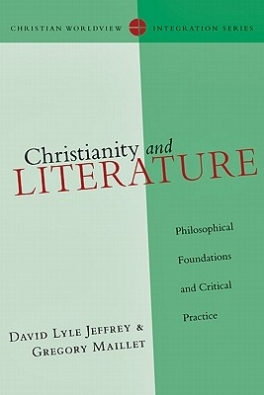 Gregory Maillet and David Lyle Jeffrey in our search for Christian guidance in approaching English literature, past and present. While you may wonder how I can make such a claim before reading the book, I do have good reasons, given my experience with the authors, particularly Dr. Maillet. Throughout my undergraduate program at the University of Regina, I took a number of courses with Greg, including Shakespearean Tragedy and Comedy, the Bible and Literature, Dante’s Divine Comedy, and perhaps most importantly for my own career, Old English Language and Literature. Greg taught all of these classes not only as an impeccable academic, but also as a Christian genuinely interested in the well-being of his students and the ways that their lives could be enriched through the study of literature and the larger philosophical and theological matters it approaches. As his Teaching Assistant and student, I learned much from his quiet but confident faith in Christ that was evident in his approach to literature, and I also appreciated the space he made for students like me to reflect on how we might learn to think about literature and literary theory as Christians. On a more personal level, I probably would not be pursuing my current line of academic study, Old English Literature, if it weren’t for Greg’s influence; not only did he go out of his way to persuade the university administration to let him teach the rarely offered Old English literature course in which I first learned the language; but he also encouraged me to study Latin at a moment when I was uncertain about my future academic plans; both of these languages continue to be instrumental in the work that I do. In any case, given the advent of this new book by Drs. Maillet and Jeffrey, I wanted to share with you the impact that Greg’s faith has had on my life, not only in the hope that some of you will take the opportunity to benefit from the wisdom of both these superb scholars, but also in the hope that you will be encouraged by this story of someone whose faithfulness to Christ in the academy continues to testify to the grace of God. Karl Persson is a Doctoral Candidate working on the intersection of Biblical and Old English wisdom literature; theologically, he is interested in being a good husband to Meg, being a good father to Andrew, and working out a theological grammar that allows us to speak appropriately and well about issues concerning God, suffering, and the broader problem of evil. An eclectic collection of news and views from the past week on faith, language, and literature, as well as other topics of interest. John Dyer discusses how the internet has changed theological debate in an thought-provoking article for Christianity Today entitled “Not Many of You Should Presume to Be Bloggers.” I suppose I could attribute my own failure to write a full-length blog post this week to Dyer’s influence. It’s more likely, however, that four evenings straight of church functions played a bigger role. Okay, this one is actually from two week ago, but it’s still worth sharing anyway. Apparently C.S. Lewis’ long-lost translation of the Aeneid is not so lost after all. The translation, which was thought destroyed in a bonfire in 1964, was discovered spread throughout the papers Walter Hooper saved from that fire. Yale University Press is releasing it April 4 under the title C.S. Lewis’ lost Aeneid: Arms and the Exile, edited by A.T. Reyes. Check out Reyes’ article about the fascinating work of stitching back together Lewis’ (regrettably incomplete) take on the epic at the Yale Books blog. In other news of the long-lost rediscovered, a group of researchers has recently claimed to have found the city of Atlantis… in a swamp in Spain. If true, it’s a somewhat inglorious resting place for the great empire of which Plato speaks. For all the info, check out The Telegraph‘s story “Lost city of Atlantis ‘buried in Spanish wetlands. '” If memory serves, this is the third such discovery of Atlantis since 2001. Good advice when it comes to news of underwater cities: don’t hold your breath. An eclectic collection of news and views from the past week on faith, language, and literature, as well as other topics of interest. The first of what is to become a regular Friday feature. Repentance taking too much time? Not a problem. The Moniter reports that a United Methodist church in Texas has taken to offering a Drive-Thru Ash Wednesday service. No word if you can get fries with that. The Business Insider reports on the “10 Most Endangered Languages in the World.” It’s very likely at least some of the languages they list (with one speaker) are already extinct without linguists knowing. In any event these languages are a little beyond “endangered.” “Moribund” is the better term. “The Holy Post” (religion blog of The National Post) reports that Canadian Anglicans (ACC) will be debating this summer whether to allow non-baptized to take part in Communion. BBC News reports that a rare first edition of the King James Bible has been found in a village church in England. The discovery is all the more significant considering this year is the 400th anniversary since the translation was first published in 1611. Finally, The Atlantic presents a brief commentary on Alexander Graham Bell’s notebooks, with plenty of “delightfully weird” sketches for your enjoyment. It’s fair to say that the artistic ability of inventors seems to have declined a bit since Da Vinci’s day. This Lent I am giving up Facebook. I first began this practice back in 2009, and while at the time I was unaware of anyone else doing it, I have since learned that Facebook-fasting (or Fast-booking, if I might so call it) is becoming a very popular Lenten observance, particularly among young Christians. In some ways, choosing to give up Facebook for Lent is kind of a no-brainer for me. I’m not a big fan of chocolate so giving it up wouldn’t be much of a sacrifice. Likewise it wouldn’t be that big of a deal for me to give up meat; I often forgo it at mealtime anyhow. But when I think about my daily habits, the things I enjoy doing on a frequent basis, one thing pops to mind (perhaps a bit too quickly): Facebook. In many ways, my generation is the “connected generation”. Cell-phones, texting, Twitter and Facebook… for many youth and young adults, these services are simply part of daily life. And while I have (fortunately) thus far avoided texting, I was caught in the gravitational pull of Facebook some years ago. The ability to keep up with friends near and far, plan events, and follow the updates of organizations which interest me were all big attractions. I have since found Facebook an excellent tool for all these things and more. But, like any tool, it can be misused. Or perhaps I should say over-indulged. Since joining the social networking site, I find myself taking frequent breaks from whatever I am doing to “check Facebook.” More often than not, nothing has happened, as I just checked the site a half hour previous. Now in honesty, for me this doesn’t add up to all that much time spent on Facebook. I pop on for a few seconds and then pop back off. Why then, you might ask, do I choose to give it up for Lent? If it isn’t that time-consuming a habit for me, why should I give it up? Let’s be clear on something: Lent is not diet-season. It’s forty days of fasting. And believe me, dieting and fasting are two very different things. When we diet, we give up an enjoyment because we’ve been enjoying it to an excess – whether it’s food or Facebook or any other thing else. We’ve over-indulged, so we cut back. But when we fast, we fast in order to draw closer to God. People who fast from lunch during Lent can use the time which would normally be spent eating for prayer or Scripture reading. By sacrificing something enjoyable – like chocolate – others can reflect on the infinitely greater sacrifice of Christ. People who are tempted to break their fast from meat might use the opportunity to focus on the temptations of Jesus, after he had just spent forty days without food of any kind. I give up Facebook for Lent because it affords me an opportunity for more spontaneous prayer throughout the day. Anytime during Lent when I think, “I should check Facebook,” I instead take a minute or two to pray. And because I normally would check Facebook a number of times during the day, I end up spending far more time in prayer than I otherwise would. Eventually, the thought popping into my head during Lent becomes “I should say a prayer” rather than “I should check Facebook.” And that’s a reformation of my mind for which I’m more than happy to sacrifice Facebook for forty days every year. Captain Thin is powered by	WordPress 5.0.4 and delivered to you in 0.401 seconds using 33 queries.